I am always surprised in my classes at the number of people who have never tried to make homemade mayonnaise. This is unfortunate, because it is so very delicious...far superior to its commercial counterpart. For this reason, I was pleased to see a recent edition of NPR's "The Salt" touting the ease with which one can make mayonnaise at home. For the story they had interviewed British chef Simon Hopkinson (British cookbook author and founding chef of Bibendum...for those familiar with the London food scene). The interview is educational and entertaining...definitely worth the few moments of your day that it will take to listen. I was however disappointed to hear Hopkinson discouraging the use of a food processor. He claims that the food processor produces mayonnaise that is thick and sticky...somewhat like peanut butter. Since I couldn't disagree more...and since most Americans have a food processor...I thought today that I would devote an entire post to food processor mayonnaise. Classically mayonnaise is nothing more than a mixture of egg yolk, Dijon mustard, lemon juice/white wine vinegar, a neutral oil (like canola), and salt & pepper. It is what is known as an emulsified sauce because the liquids (lemon/vinegar and water—present in the yolk itself and also often added at the very end to give a thinner consistency) are held in a homogenous and permanent suspension (called an emulsion) with the oil. The thing that keeps the liquid and oil from separating (which they are naturally inclined to do) is the presence of an emulsifier—a naturally occurring permanent suspension of water and fat...in this case, the egg yolk. Mayonnaise is made by gradually incorporating oil into the egg yolk. When this is done slowly and steadily the homogenous suspension is maintained and the result is a thick, smooth, creamy sauce. If the oil is incorporated too quickly, the suspension "breaks" and you end up with a bowl of thin, separated liquids and oil. As you can imagine, preparing this emulsified sauce by hand (with a whisk) can be tedious and tiring. It is not uncommon for people to produce a "broken" sauce on the first try or two. And even though the procedure is most often successful, people generally don't want to expend the physical effort required. This is of course where a machine comes in. Hopkinson suggests the use of an electric whisk. Some people use a traditional blender...or an immersion blender. My preference is the food processor. What all of these have in common is a blade...or whip....of some kind that moves quickly and at a uniform speed. You simply place the egg yolks, lemon, mustard and salt in the bowl/blender cup, turn on the machine and pour in the oil in a thin stream as the machine runs. In very short order...with no wear and tear on the arm...you have mayonnaise. Since most people don't have a need for large quantities of mayonnaise, most home recipes are for small batches—made with 1 or 2 yolks and a cup or so of oil. And for a recipe this size, a standard sized food processor doesn't work so well. The volume of 1 or 2 egg yolks is quite small and the action of the blade sends what little volume there is out to the edges of the bowl. It is very difficult to get the emulsion started because it is almost impossible to gradually incorporate the oil—which is also being sprayed to the outer edges of the bowl—into the tiny volume of yolk(s). This is why Hopkinson recommends a narrow beaker type container when you use his electric whisk...and why an immersion or traditional blender work so well....all of the yolk is concentrated in a very small area and it is easy to gradually drizzle the oil right into the yolks. If you are making a larger batch of mayonnaise (with 5 or 6...or more...yolks) the food processor does very well. But it is not impossible to make a small batch of mayonnaise in a food processor. And the trick I use to do it also avoids the thick and sticky consistency that Hopkinson deplores. To make a small batch of mayonnaise in the food processor, simply use a whole egg...or a whole egg plus one yolk...as the base. The egg white effectively increases the volume...and the viscosity...of the initial mixture so that the oil is more easily incorporated a small amount at a time. As a bonus, because egg whites have a wonderful foaming capacity when they are beaten, the addition of an egg white to a mayonnaise made in a food processor lends a light, fluffy quality that is the antithesis of thick and sticky. The resulting mayonnaise is just about perfect...and almost never needs the usual addition of a bit of water to thin it down. If you have never tasted homemade mayonnaise, you will be amazed by how good it tastes. You may use it just as you would commercial mayonnaise. 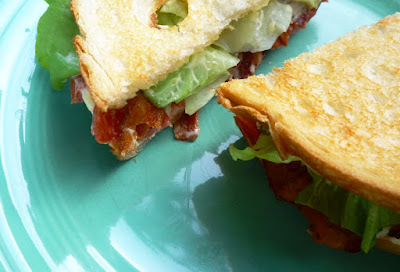 I have posted several recipes calling for mayonnaise over the years (Basil & Garlic sauce to go with Basil & Garlic Roast chicken, Green Goddess, Blue Cheese & Ranch Salad Dressings, Waldorf Salad), and any one of these would be a great place to start. Unfortunately your homemade mayonnaise will not have the same lengthy shelf life of store bought. But if you make it with fresh eggs, from a source that you trust (hopefully a local farmer), it will keep safely in a cold refrigerator for about a week. However, I predict that it won't last that long. In fact, it is so delicious that you will probably be looking for ways to use it. You can of course enhance it in any number of ways (with a spoonful of pesto...or roasted pepper purée...or a handful of minced herbs and some garlic...) to make a dip...or a spread...or a sauce. You could also make a BLT...before the vine ripened tomatoes of summer disappear for the year. 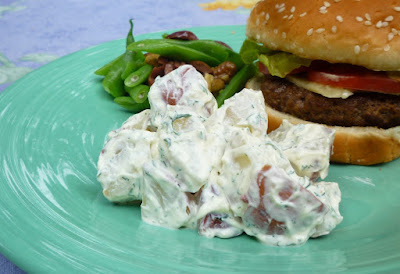 or make a simple potato salad to go with burgers (don’t forget to put a smear of mayo on your burger too). Place egg, yolk, salt, lemon juice & mustard in the bowl of the food processor and process until smooth. Add the oil in a slow stream through the feed tube. A thick emulsion will form. Taste and adjust the lemon and salt. If the mayonnaise is too thick, let it out with a few tablespoons of warm water. Cover and refrigerate until ready to use. Deviled Eggs: For each hard cooked egg, you will need about 10 grams (2 t.) of mayonnaise and a smidge of Dijon. Cut the peeled, cooled eggs in half, and carefully remove the yolks. Set the whites aside. Press the yolks through a sieve or smash with a fork. Mix with the mayonnaise and Dijon. Add salt & pepper to taste. Spoon or pipe the yolk mixture back into the whites. Sprinkle each egg with a little Spanish smoked paprika. Chill until ready to serve.